Cabled Cardigan from Lullaby Knits. I suspect the baby girl receiving this sweater may require some Liberty baby bloomers - Yes? It's baby season around here (not for me) which means baby knitting. Nothing more fun that that. So I thought I would do a little roundup of some of my favourite/new go-to patterns for baby knitting. Starting with the sweater in the photos. It comes from the book Lullaby Knits. While I wouldn't say this book was for beginners (as the gauge information tends to be fairly confusing which could lead to some wacky results) I do think this sweater and others in the book are gorgeous! This sweater ranks as one of my favourite baby knits ever. The whole range from Paelas - which is a collaboration between three women in Norway. Check out their individual instagram feeds which you can find from their About page. So beautiful. I am particularly taken by the Flash top and know I need one for one of my girls. 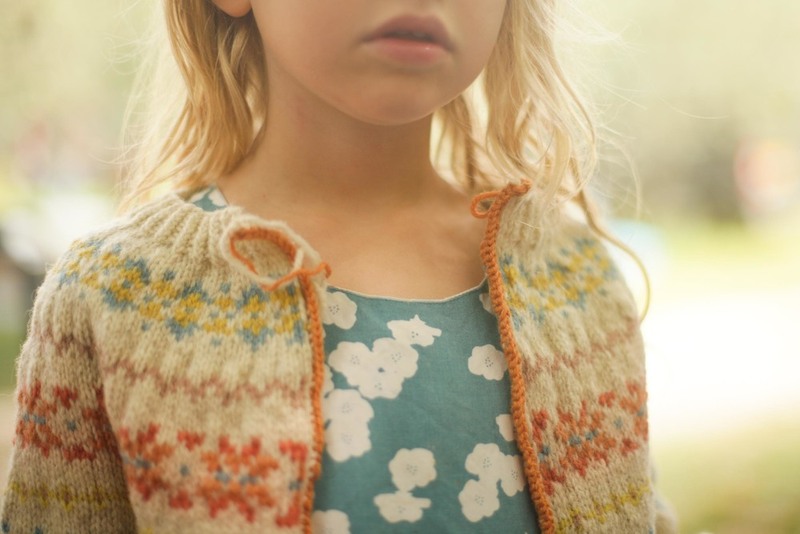 The I've-never-made-it-but-always-meant-to Baby Fairisle Cardigan from Purl Soho. I saw a version of this a little while ago that I can't get out of my head. I was thinking that maybe I should make a version with the scraps of my colourwork cardy - just need to find a mother that doesn't mind semi-scratchy wool for her small person. The Pebble Vest by Nikol Lohr - possibly the most practically useful baby knit ever. I finally got around to putting the buttons on one I made ages ago and sent it along to a baby this week. Silver Fox by Lisa Chemery - I love the fit on this little cardy and the icord edging. I might take out a few of the details when I made it to make it a smidge simpler. Another similar pattern is super sweet Eole by the lovely Nadia of IttyBitty. I saw one of these in real life of Amy of Sunspun's little girl recently. So gorgeous! I'm still totally obsessed by this bonnet here (which I have made a few times) and this cardy here. Classic knits that are super fun to knit - I will be making them again. Alrighty….stopping now. Tell me your favourites. I would love some new ideas! What crafting looks like today…. Dodgy iphone photo at the Colosseum today. So here I am again without a finished post and it is getting too late to finish the one I have half done - it will come Monday. So I thought I would share a little of what crafting time looks like for me at the moment. We are currently in Rome - it is a little bit sticky and we have been taking the kids to "the" sights. As it is now the European summer, that involves people and queues that are somewhat unimaginable in sunny Australia. We limit ourselves to one thing a day (because we know our/their limits), before returning to the flat for some reading or colouring. There are few spaces in my day when I am alone and even fewer where there isn't something that needs to be done. The fella and I were talking yesterday about the fact that "freestyle overland travel" is not exactly the same thing as a "relaxing holiday". We were a little naive methinks about what life would look like on the road ;). So crafting - Life as it currently stands means that knitting is not exactly relaxing-with-a-cup-of-tea crafting. I'm not really able to knit in the campsite/flat due to the aforementioned jobs. Instead I've moved to mobile crafting in order to scratch the itch. Crafting is more along the lines of standing in a queue, with small people who are hungry or need to go to the toilet, using knitting as a way to keep on smiling. And car knitting - oh how I love car knitting! We leave tomorrow to get back to camping which means there will be a few hours of click-clack which I am super excited about. I know that school holidays have just finished at home so I am guessing that crafting slowed down for a bit? I would love to hear about how you fit your making into your holidays….or are you infinitely more sensible and give it up until some space returns?